There is currently just the 1 ferry route running between Lanzarote and La Graciosa operated by 2 ferry companies – Biosfera Express & Lineas Maritimas Romero. The Orzola to La Graciosa (Caleta del Sebo) ferry crossing operates daily with a scheduled sailing duration from about 25 minutes. Whilst we’ve taken great care to ensure the information on this page is correct, as the frequency and duration of crossings on all routes can vary from time to time we’d advise that you get a live quote for current availability on this Lanzarote La Graciosa crossing between Orzola and La Graciosa (Caleta del Sebo). Often referred to as the ‘eighth Canary Island’, La Graciosa sits just offshore from Lanzarote’s north coast, the most north-easterly of the main islands. 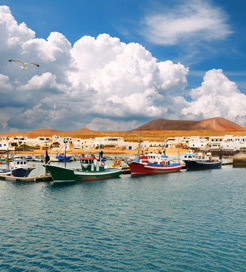 For a great daytrip when visiting Lanzarote, look no further than La Graciosa, a small yet beautiful island, home to only five hundred permanent inhabitants and fringed entirely by golden sand. Surrounded by one of two marine reserves in the Canaries, diving in turquoise water is one of the best attractions, while excellent surf breaks can be found off Playa Francesa on the south coast. Bikes can also be hired to explore the winding dirt tracks, offering sumptuous views of Lanzarote in the distance. 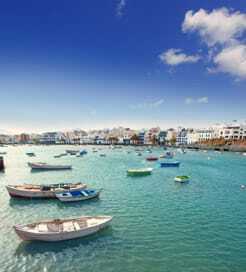 Ferries from Lanzarote make the twenty five minute journey nine times a day, with a choice of excellent ferry operators departing from Orzola and arriving in Caleta del Sebo on La Graciosa’s southeast coast.